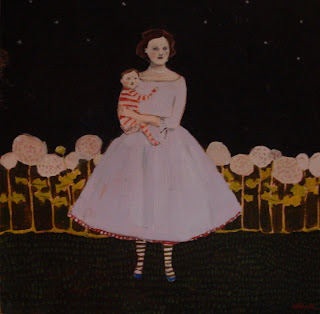 I am an oil painter living in Portland, Oregon with my husband and two little children. I recieved my BA in fine arts from the University of Oregon, studied watercolor in Siena, Italy and oil painting and print making at the Chautauqua Institute in New York. I have been painting professionally since graduating in 2000. Current obsessions include imaginary friends, snow, little mammals, folklore, superstitions, fortunetelling, wildflowers, wallpaper, cloudy landscapes, the colors of faded polaroids, and other peoples family snapshots.